There are four lubrication regimes - boundary, mixed, elastohydrodynamic and hydrodynamic. Boundary lubrication is associated with metal-to-metal contact between two sliding surfaces of the machine. During initial start-up or shutdown of some equipment (e.g., journal bearings) or under heavily loaded conditions (pins and bushings of construction equipment), the metal surfaces in a lubricated system may actually come into severe contact with each other. If the oil film is not thick enough to overcome the surface roughness of the metal, a lambda value of less than one results. We generally want to avoid boundary lubrication where possible. It is agreed among lubrication specialists that friction may be at its highest level during the boundary lubrication regime. This occurs at start-up, shutdown, low speed or high load conditions. 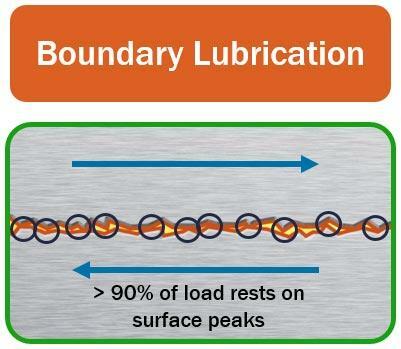 Boundary lubrication regimes occur during any condition where the asperities of two lubricated surfaces in relative motion may come into physical contact and the potential for abrasion and/or adhesion occurs. It has been suggested by lubrication engineers and tribologists that as much as 70 percent of wear occurs during the start-up and shutdown phases of machinery. A main method of reducing boundary lubrication is to provide the correct lubricant viscosity. A lubricant with too low of a viscosity cannot keep the metal surfaces separated, and metal-to-metal contact occurs. A lubricant with too high of a viscosity will result in an increase in the oil’s molecular friction. This internal oil shearing action causes layers of oil to slide past each other and will in turn increase operational temperatures and energy loss. A back-up or secondary method of reducing this phenomenon of the boundary lubrication regime is with the use of a fully formulated lubricant that includes anti-wear or extreme pressure additives. These additives react with the metal asperities that have come into contact by responding to the high pressure and high temperature of contact and instantly forming an altered ductile (pliable) film on the metal (iron) surface. This new film then acts sacrificially as the surfaces slide or roll over each other. The chemical film formed by the additive is worn away instead of the metal surface. Generally speaking, boundary lubrication is dramatically reduced as sliding speed increases, creating a wedge of lubricant film between the surfaces in motion. As the potential for asperity contact is reduced and film thickness is increased, the coefficient of friction drops dramatically to the condition known as mixed lubrication. Some metal-to-metal asperity loading is still occurring combined with loading (lift) on the lubricant. This is an intermediary condition between boundary and hydrodynamic/elastohydrodynamic lubrication regimes, the gray area between them. 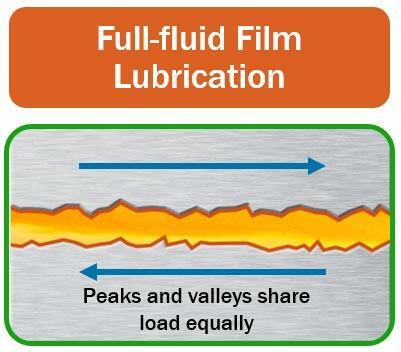 As the oil film thickness increases further, the system now moves into full film lubrication, either elastohydrodynamic or hydrodynamic lubrication. 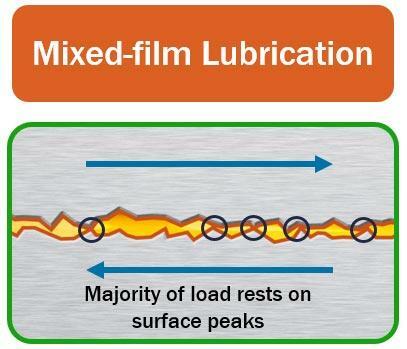 This lubrication regime occurs between sliding surfaces when a full film of oil supports and creates a working clearance (e.g., between a rotating shaft and journal bearing). 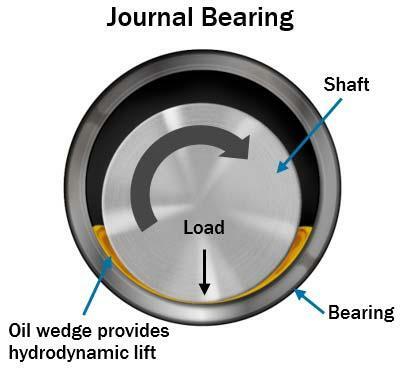 In order for hydrodynamic lubrication to be successfully and completely applied, there must be a high degree of geometric conformity between the machine components (e.g., the curve of the shaft and the curve of the shell in a journal bearing are very similar) and a resulting low-contact pressure (100 to 300 psi in industrial journal bearings) between the surfaces in relative motion. This lubrication regime condition occurs after a machine has begun to rotate and the speeds and loads are such that a wedge of oil has been formed between the shaft and bearing surfaces. This wedge of oil lifts the shaft away from the bearing surface so there is little risk of asperity contact. This is a desirable condition to avoid friction and wear. Any friction remaining is found within the lubricant itself, as the molecular structures of the oil slide past each other during operation. Oil films are typically in the order of 2 to 100 microns (0.00008 to 0.004 inches) thick. They can be larger (300 microns or 0.012 inches) in very large diameter journal bearings. Lambda values (oil film thickness to surface roughness ratio) are usually greater than 2. For hydrodynamic lubrication to be effective, the oil’s viscosity must be such that the hydrodynamic condition will be maintained under every operating condition, such as high speed and high load, low speed and high load, low speed and low load, etc. If the operating conditions cause the working clearance to be reduced too much, metal-to-metal contact between the metal high spots or asperities could occur. If the oil’s viscosity is too high (thick), the internal resistance (drag) of the oil’s molecules will reduce operating efficiency and temperatures will increase. It may be helpful to think of hydrodynamic lubrication as being like hydroplaning when a car tire loses contact with the road. The heavy car can be supported on a low-viscosity fluid (water) and loses contact with the road due to the speed of the car. Many of the same factors are taking place in hydrodynamic lubrication. 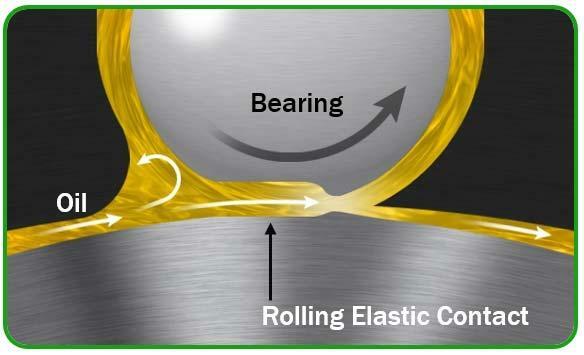 Elastohydrodynamic lubrication conditions occur when a rolling motion exists between the moving elements, and the contact zone has a low degree of conformity. For example, note that the curve of the roller and the race in a rolling element bearing are very dissimilar. In fact, the roller and inner race are curved in opposite directions and thus have a small contact area (almost a single point of contact). This creates high-contact pressures (hundreds of thousands of psi). As the oil enters the contact zone between a ball and raceway (by rolling action), the oil’s pressure rises sharply. This high pressure in turn significantly increases the oil’s viscosity and load-holding ability. This concentrated load will slightly deform (flatten) the metal of the rolling elements and race in the contact zone. The deformation only occurs in the contact zone, and the metal elastically returns to its normal form as the rotation continues. Obviously, the metallurgy and heat treatment of the metal are very important to this lubrication regime. Because an oil’s viscosity is directly affected by temperature, it is also clear that incorrect or abnormal operating temperatures will interfere with the formation of the elastohydrodynamic lubricating (EHL) film. Examples of machinery applications that operate under EHL are rolling element bearings, gear teeth and cam contacts (rolling) where high rolling contact loads occur. If operating conditions such as speeds, loads and temperatures are not exceeded, asperity contact may never occur due to this remarkable characteristic of lubricant and metal. The oil film thicknesses are often in the order of 1 micron (very, very thin). However, EHL is considered to operate on a full fluid (oil) film (surface asperity heights are in the order of 0.4 to 0.8 microns).